For a community that prides itself on rising early, it’s never been easy for me to roll out of bed earlier than 7. So when my alarm went of at around 5:15 AM a week ago, the time I needed to get out of bed, gather my things, and get out in time for sun-up, I was wondering exactly why I’d agreed to this. I had been contacted by Bill at Birds & Beans Coffee, a wonderful shade-grown distributor I’d been using for a few years, to help do a breeding bird survey on a local organic farm. The premise, as I understood it, being that this survey, one of four done this June on organic farms across the country, would be a way to compare bird populations with similar surveys done on shade-grown coffee farms in Central America. The original surveyor had fallen through. I was local and potentially up to the task. I agreed, hesitantly, and made plans for late June. I wasn’t precisely sure what was expected of me. There was no protocol other than show up, walk around, keep track of what you see – which is pretty much all I do as a birder anyway. So I pulled in as the sun peeked over the horizon and met briefly with the owner, who was wrapping up his own early Saturday morning ritual of packing up goods for the local farmer’s market. He gave me the layout and sent me on my way. Barn Swallows lined up on the wires outside his cattle barn and Grasshopper Sparrows sang unseen from uncut hayfields. The place was birdy, that much was clear, and I headed down the road towards a creek with no particular plan, quickly adding a good variety of open country birds to a burgeoning list. I don’t expect that the rural Piedmont of North Carolina is much different from similar areas across the United States and even the world. There are rolling hills covered mostly in soybeans and corn these days. Expansive pasturelands, some better managed than others. This particular farm, however, had a lot of acreage set aside in a conservation easement and down here I found a creek lined by willows that hosted Blue Grosbeaks, Yellow-billed Cuckoos, and a single singing Common Yellowthroat, among other things. All are migrants to some extent and all would be interesting for this particular project. I wandered back along a tractor path through fallow fields and an overgrown shed that hosted a pair of Orchard Orioles. Turning a corner and looking down into a grove of sumac trees in an unplowed draw I heard a familiar song. It took me a second to make the connection, having not heard it in North Carolina in a couple years at least, and I arrived quickly at Dickcissel. “That’s ridiculous”, I thought, “they’re not supposed to be here”. And yet it sang again. And again. Clear as day and obvious as if it were sitting right in front it me. Which, in fact, it was, though obscured by grass and sumac boughs. I played a smidgeon of tape and a male teed up on top of the sumac. There was no mistaking this bird, the bulky grosbeak with the meadowlark-inspired plumage. Now, I know that in many places in North America this is hardly a notable sighting. West of the Appalachians one pretty much just has to roll up to a weedy field, open a car window, and be inundated with Dickcissel song. But Dickcissel is pretty uncommon in most parts of the state. And in my county, this was only the 5th record, and the first since 1983. There were a number of serious Greensboro-area birders who had never seen it within the confines of Guilford County or even in the state. So I was pretty stoked to find it and even more stoked when a number of those birders make contact with the bird a few days later. But it gets better. 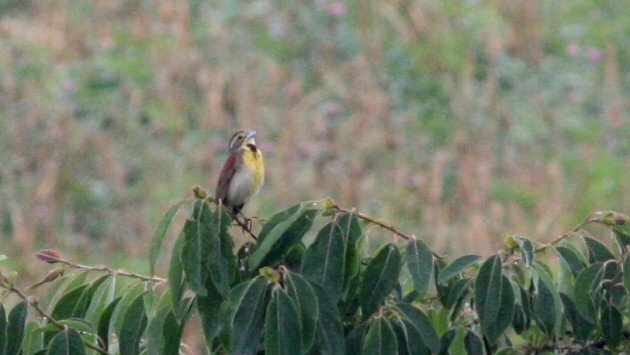 Not only did those birders find one Dickcissel, they found two other males singing nearby. And a birder just the other day went back and refound not only those three, but a female and a juvenile bird as well, more or less confirming that they were breeding in the area. So my county has gone from 4 records to confirmed breeding in about a week and a half. Pretty sweet. All because I managed to roll out of bed early. It may pay off, but that doesn’t mean I’ll be doing it again anytime soon. Nate Swick is a birder. He grew up in the midwest but currently makes his home in Greensboro, North Carolina, with his wife and two young children, who are not yet aware that they are birders too. He has a soft spot for Piping Plovers and loves pelagics even when his stomach doesn’t, which makes him the quintessential Carolina birder. Nate is the editor of the ABA blog, host of the American Birding Podcast, and author of two books, Birding for the Curious and The ABA Field Guide to Birds of the Carolinas. Nice post. I hear the The Global Birder Ranking System has taken notice of your achievements. “West of the Appalachains” and south of Michigan! During my days in Ann Arbor / MI, Dickcissels were very nice birds. They do occur along the southern state border, but people still would go out to certain counties specifically to see dickcissels (and henslow’s sparrows, and both meadowlark species). Their abundance around St Louis made me a very, very happy chappy. Thanks for a great post and bringing back those memories! Spring Spring Spring! First Day of Spring!